When I was in Scotland this summer, I stopped in a card shop in this small town in the borders to get change and fell in love. Bold statement, I know. The object of my affections was not a charming Scottish man or even the store’s resident (and adorable) terrier, but an image that I saw on one of the cards: the Highland cow. It was there, staring at me from the shelf, with big eyes halfway hidden under its long, expressive hair. I loved this creature; I knew that my trip would not be complete until I saw one in person. 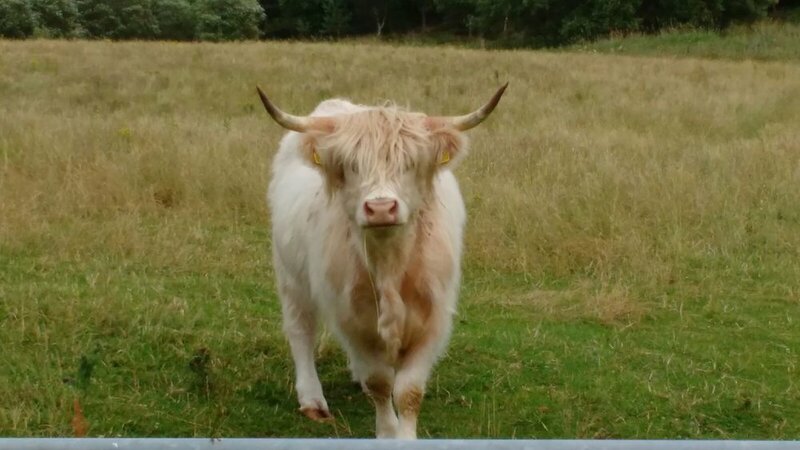 The Highland cow—or Heilan coo, if you are hearing about them from a Scot in Scotland—is the oldest registered breed of cattle, descendant of the Hamitic Longhorn. They are a hardy breed, able to survive and thrive in the harsh conditions of the Western Islands and the far north—some say nearly as well as caribou and reindeer. Their unique coat is double layered, the oily outer layer acting in a similar fashion as a raincoat and the downy under layer providing warmth in cold weather, making them uniquely adapted for the typical Scottish climate. The long fringe around their eyes not only makes them look ultra hip, but also serves to protect their eyes from the elements. As they were originally bred to produce milk and meat for farmers, groups of Highland cows are called “folds” instead of “heards” after the open stone shelters in which they were traditionally kept during cold winter nights. After adventures driving up past Loch Ness, the cliffs of the Isle of Skye and all of the possible Harry Potter activities we could squeeze in, it got to the last night of our trip and I still hadn’t seen my coo. I was heartbroken. Going for a walk to ease pre-travel jitters later that evening, we came upon an open pasture. Lo and behold, there they were, in all of their majestic glory. I froze, my heart full, soaked in the beauty of the creature I had been seeking for the past ten days and felt overwhelming gratitude at my luck. Magic really is everywhere, especially when we are least expecting it.